NOAH is our online church life system that helps us to better connect with you. You can use NOAH to book seats in advance for our first two English services at The Star Performing Arts Centre (The Star PAC) on Sundays and Encounter Night services on weekdays, book a space for your children in our Rock Kidz (children's ministry) classes for any of the four services at The Star PAC, apply to join a care group or ministry, sign up for church events, stay updated with the latest church announcements or send in a testimony of what God is doing in your life. If you are unable to book a seat, there are 1,000 seats available via the walk-in queue on Level 3 of The Star PAC, on a first come, first served basis, unless specified otherwise. Alternatively, you can choose to attend our 3rd or 4th service at The Star PAC where seat booking is not required, or join us at any of our other service venues. Seat booking is also available for Encounter Nights and the booking begins one week in advance on Wednesday, 8.30am and ends on Sunday, 6pm. Alternatively, there are 2,500 seats available via our walk-in queue on Level 3 of The Star PAC. These are available on a first come, first served basis. Please note that there are no Rock Kidz classes for our Encounter Nights at The Star PAC, and we are unable to accommodate parents who may wish to sit with their children aged 12 and below. If you wish to attend the service with your children aged 12 and below, we have a room available to accommodate both you and your children. What type of NOAH accounts are there? How do I create a NOAH account? Create a new basic account using the steps below. If you are registering for NOAH or logging in for the first time, please access NOAH using your desktop or laptop computer, instead of your smartphone. An email with a link to activate your account will be sent to you at the email address you specified during registration. Please click on the activation link within seven days, otherwise it will expire. If the activation link expires before you have activated your account, follow the steps above to create a new account again. How do I update my NOAH profile? Now that you are logged into NOAH, the first thing to do is to update your profile to ensure that your personal particulars are current. This helps us to understand your needs better. On the top menu, click on “My Profile”, then “View/Edit Profile”. 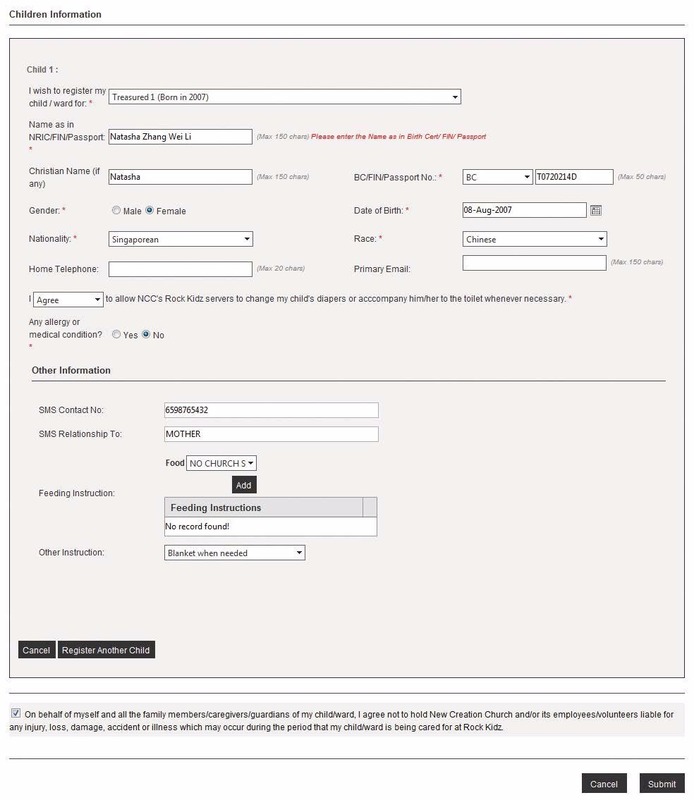 Then fill in your information on the “Personal Particulars”, “Contact Details” and “Employment Information” tabs. On the “My Ministry” tab, check to ensure that your information is correct. If the information needs to be updated, contact your ministry administrator. To proceed with this step, ensure that you and your family members (who are at least 13 years old in the current year and who are attending our church) already have their own NOAH accounts set up. This way, you can create family links within NOAH. On the top menu, click on “My Profile”, then “View/Edit Profile”. Then click on the “My Family” tab, followed by “Add Family Member”. Fill in the details of your family member. 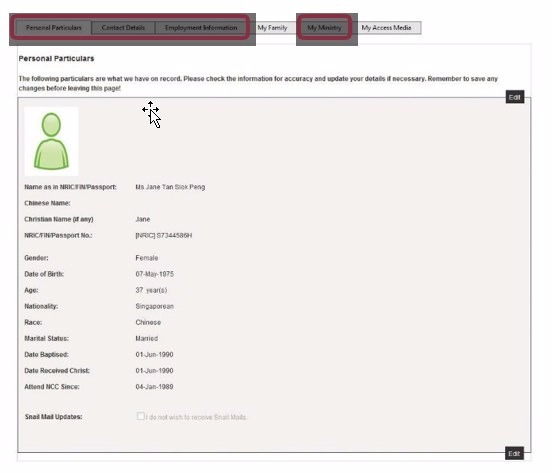 After entering the NRIC/FIN/passport number, if NOAH finds a matching profile in the system, the rest of the personal particulars of your family member will be auto- generated. You may then click “Submit”. If NOAH does not find a matching profile in the system based on the NRIC/FIN/passport number, it means that your family member has not created his own NOAH account. At this point, you will be prompted to create a basic account for your family member by entering more of his personal particulars. Please ensure that the information entered, especially date of birth and email address, are correct. Click “Submit”. Your family member will then receive an email with a link to activate his account, at the email address you specified during registration. He must click on the activation link within seven days, otherwise it will expire. If the activation link expires before he has activated his account, he will need to create a new account again. He must have a NOAH account before family links can be established. A “relationship request” will be sent to the family member you have tried to add. He will need to confirm the request before the family link is established and you can start booking seats for each other. You can only book seats for each other one day after the relationship request has been confirmed. So do set up your family links as early as possible. To add more family members, repeat steps 1 and 2. Your family member will need to log in to his NOAH account, then to “My Profile” and “View/Edit Profile”. He can then click on the “My Family” tab to confirm your request. Similarly, if you receive relationship requests, you will need to log in to confirm or reject the request. Remember, your family members and relatives must have their own NOAH account before you can link up with them. So encourage them to register for an account if they don’t have one yet. How do I add children (aged 12 and below) to my profile? You have now established family links with your family members aged 13 and above. If you have children aged 12 and below, you will also need to update their information and add them to your profile. This will enable you to book them into Rock Kidz classes at The Star PAC on Sundays. Even if you and your children intend to attend services and classes at our other service venue, Marina Bay Sands Ballrooms (MBS), where booking is not required, please take a moment to update your children’s information. Rock Kidz will be obtaining important information such as contact numbers (for SMS updates and emergencies) or medical instructions from your NOAH account. Your children aged 12 and below will not have their own NOAH accounts and they will not need to confirm the relationship requests. Both parents and guardians can book children into Rock Kidz classes. On the top menu, click on “My Profile”, then “View/Edit Profile”. Then click on the “My Family” tab. Click on “Add Family Member”, fill in the required fields and click “Submit”. Your child will be added to your profile, and you will be able to edit and update his particulars. To add another child to your profile, click on “Add Family Member” again. Click on “Register Children With Rock Kidz”. You will be prompted to fill in the Rock Kidz registration form. Information on your spouse and your child’s guardian(s) can be entered. Contact information and important notes such as medical instructions are required. If you have already established a family link with your spouse, his/her particulars will be automatically reflected. You can also assign up to two guardians to each child so that you, your spouse or your child’s assigned guardians can register or pick your child up at Rock Kidz classes. When you assign guardians to your child, they will receive a notification email. They will not need to confirm the request. However, if they would like to be removed as a guardian for your child, they will need to contact you directly. When you have filled in all the particulars, click on “Submit”. If you wish to register another child, click on “Register Another Child”. 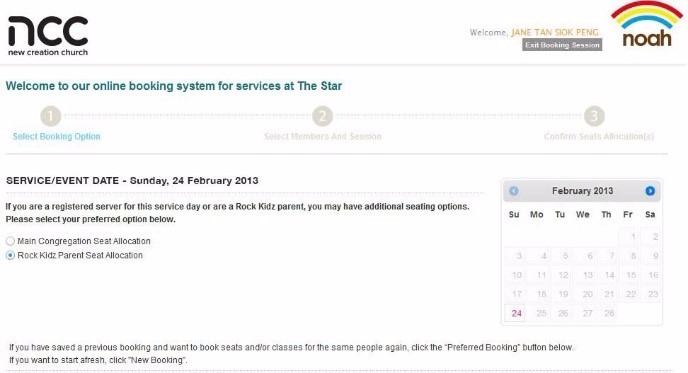 Your children are now linked to you and you will be able to book them into Rock Kidz classes at The Star PAC. Do note that if your spouse would also like to be able to book your children into classes, he/she will also need to add the children into his/her profile. Note that you, your spouse and your children’s guardians will require a registered access media to register your children at Rock Kidz. To learn more about this, refer to the next section of this guide. What is access media and how do I register it? An access media is needed to book seats for the first two Sunday English services or for Encounter Nights at The Star Performing Arts Centre (The Star PAC), and to book children into Rock Kidz classes for all four services on Sundays there. 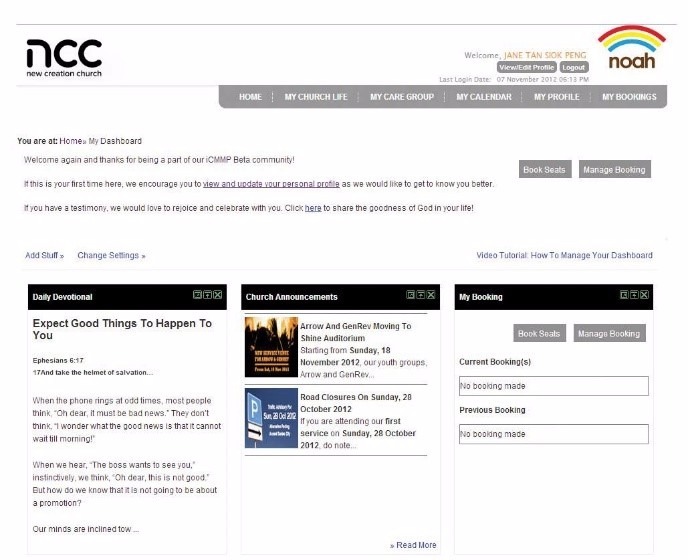 You can register your access media via NOAH, our online church life system. On your NOAH account homepage, select 'My Profile' on the top right menu bar. Click on 'View/Edit Profile', and then click on 'My Access Media'. Click 'Edit' and fill in the details of your access media as indicated in the picture below. Click 'Save' to register your access media. Children attending Champions, Beloved and Treasured classes: An access media is needed to register and pick up your children. What is a Commemorative Card? To commemorate our church’s move to The Star PAC, we created a limited edition card as a souvenir! The card serves as one of the access media that can be used to book seats for and gain entry to our services at The Star PAC. An access media is also needed to register children for Rock Kidz classes there. Please note that registration for the commemorative card has closed. 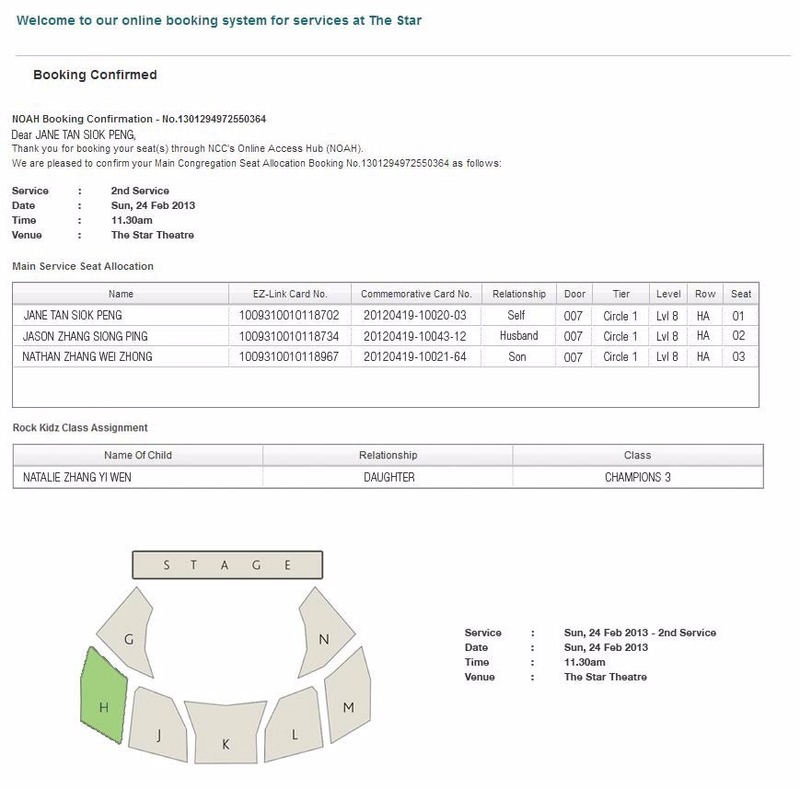 Why is a booking system needed to enter The Star PAC? We seek to manage our crowd flow in an orderly and effective manner, so as to make the service experience enjoyable for our congregation members. With NOAH, you can book seats in advance for the first two services for the upcoming Sunday every week as well as our Encounter Nights. Now you can come to church knowing that a seat has been reserved for you. Seat booking is not required for the 3rd and 4th services on Sundays. However, parents with children attending our Rock Kidz children’s ministry will still need to book class space for their children. Who are considered my immediate family members? Can we establish links with our friends and relatives? What do I need to do before I start making a seat booking? To book seats for all your immediate family members, make sure that they have been successfully linked to your account and they have also registered their access media. Seat booking is available only for the first two services. To book seats for your friends and relatives, please have their names and access media numbers ready. How do I book seats for Sunday English services, Encounter Nights and spaces for Rock Kidz classes? After you have created your profile, established your family links and registered your access media, you are ready to book seats for our English services on Sundays and Encounter Night on weekdays at The Star PAC. Booking opens every Tuesday at 8.30am for the 1st service and 11.30am for the 2nd service, and closes 2 hours before the service begins on Sunday. Seats are available on a first come, first served basis. As for Encounter Night, booking begins one week in advance on Wednesday, 8.30am and ends two hours before the service begins on Wednesday. If you choose to attend Sunday English services at The Star PAC, do ensure your children have a space in their respective Rock Kidz children’s ministry classes. Please book them into their classes when you book your own seats by choosing either the “Rock Kidz Parent Seat Allocation” option or the “Main Congregation Seat Allocation” option for any of the four services. The two options offer different seat sections for you within the theatre. Please note that there are no Rock Kidz classes for our Encounter Nights at The Star PAC. We have a room to accommodate parents who may wish to sit with their children aged 12 and below. To book seats, click on “Book Seats” on NOAH’s homepage. If you are on another web page within NOAH, you can also click on “My Bookings” in the top menu, followed by “Book Seats ”. Select service day on the calendar. Choose your preferred seating option. More than one seating option may be open to you if you are serving at The Star PAC on the upcoming Sunday or are a Rock Kidz parent. Based on the option you select, different seat sections may apply. If you are not a server or a parent attending our Sunday English service, only the “Main Congregation Seat Allocation” will be available to you. View the availability of English services and Rock Kidz classes. Then click on “New Booking”. At Section A, select the immediate family members that you would like to book seats for. Immediate family members refer to your spouse, parents, parents-in-law and children. If you have a basic account, you can book seats for yourself and up to four immediate family members/ friends/relatives. If you have a standard account, you can book seats for yourself, your immediate family members and up to four friends/relatives (see Step 6). Each person is only allowed to be booked in for one seat on any service day. For example, if you book a seat for your spouse for the 2nd service, he will not be allowed to book another seat for himself for the 2nd service or for any other service that Sunday. However, if your spouse has an account in NOAH, he will still be able to book seats for his other immediate family members and up to four friends/relatives for that service day. The number of people he can book for depends on whether he is a basic or standard account user. Please note that the group he books seats for will not be seated together with the group you book seats for, as the bookings are made separately and seats are allocated on a first-come, first-served basis. Click on “Confirm” to proceed to the next step. At Section B, confirm your children’s guardian only if you will not be attending English service at the same time as your children’s classes that Sunday. Otherwise, it is not necessary to assign a guardian. At Section C, depending on whether you are a basic or standard account user, you may book seats for up to four friends/relatives aged 13 and above in the current year. 2) an access media, and in this case, you will need to have their access media numbers (i.e. EZ-Link or EZ-Link compliant card) on hand when you book their seats. Do remind your friends/relatives to bring along their corresponding access media for service. At Section D, select a service that has the number of seats and Rock Kidz spaces to fit your group and click on “Book Seats”. Please note that after you click on “Book Seats”, you will have three minutes to review the seats assigned and to confirm your booking. Seats are available across three tiers in The Star Theatre – Stall, Circle 1 and Circle 2. Depending on the seating option you selected at step 2, NOAH will automatically assign available seats that are nearest to the stage for your group. Review the seats assigned. These seats are temporarily reserved for you at this stage. You must confirm your booking within three minutes. Otherwise, the seats will be released and you will need to restart your booking process. After you confirm your booking, your seat details will be displayed on screen and forwarded to you via email. The booking confirmation email will also include directions on how to get to your seat. Print the booking confirmation email and bring it with you to service, so that you can get to your seat quickly and smoothly. Why do I have different booking options? I’ve just opted to make New Creation Church my home church. Why can’t I book seats for my immediate family members? If you have selected the option to make New Creation Church your home church in NOAH, your basic account will be reviewed for conversion to a standard account with more features. You will receive an email notification about the review status within seven working days of registering your account. After your basic account has been converted to a standard account, you can start booking seats for your immediate family members. Meanwhile, you can still book seats for yourself and up to four friends/relatives. Why can’t I book more than five seats? As our church continues to grow, it is increasingly important to manage our crowd in an orderly and effective manner. 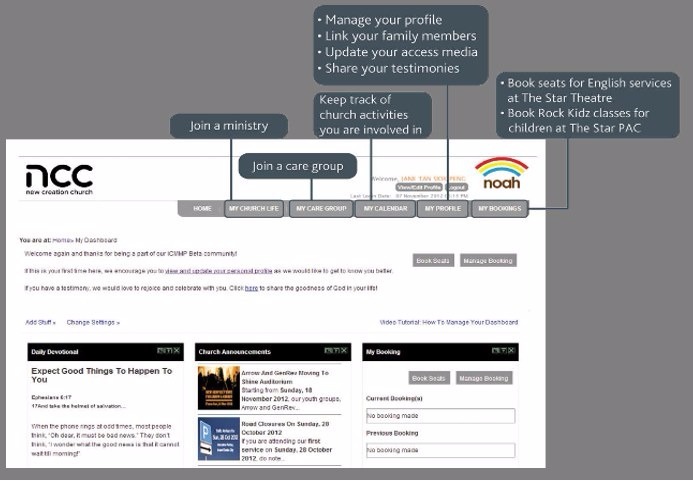 This guideline ensures that our services are available to more congregation members who want to come to our services and have signed up to book seats through NOAH. A basic account allows you to book a maximum of five seats. If you have selected the option to make New Creation Church your home church in NOAH, your basic account will be reviewed for conversion to a standard account. A standard account allows you to book seats for yourself, your immediate family members, and up to four other friends or relatives. You will receive an email notification about the review status of your account conversion within seven working days of registering. Can I make multiple seat bookings? Only one seat may be booked for each person on each service day. However, you can make multiple bookings for different services as long as they are for different people within your available booking options. Your total number of seat bookings must be within the maximum number of seats available for your account type. Can I book seats for others when someone else has already booked a seat for me? Yes you can! Only one seat may be booked for each person on each service day. If someone else has booked a seat for you, you can still book seats for others, provided they have not been booked in for a seat yet. Why can’t I attend more than one service at The Star PAC? What does “Preferred Booking” mean? I’m an overseas visitor with children who do not attend local schools. Can I still send them for Rock Kidz classes at The Star PAC? Can I book my children for Rock Kidz classes that are at a different time from the service that I’m attending? What is the QR code in the booking confirmation email used for? I have a confirmed booking. Can I add more friends to my booking so that we can attend service together? If there are changes to your schedule after you have booked seats for service, please edit or cancel your booking promptly, so that your seats can be given up to other congregation members. We appreciate your cooperation in helping us manage the expanding need for seats in our growing church! To manage your bookings, click on “Manage Bookings” on NOAH’s homepage. If you are on another web page within NOAH, you can also click on “My Bookings” in the top menu, followed by “Manage Bookings”. Rebook Seats: Cancel your current booking and book seats again. Why can’t I view my spouse’s seat booking details? Does NOAH have a “waitlist system” if seats for a service I want to go to have all been taken up? We do not have such a feature at the moment. Please select a service that has available seats to ensure that you are able to attend our Sunday English services at The Star Performing Arts Centre (The Star PAC) that week. You may also join our walk-in queue at Level 3 of The Star PAC where 1,000 seats are available on a first come, first served basis, unless specified otherwise. Alternatively, you could choose to attend our 3rd or 4th service at The Star PAC where seat booking is not required, or join us at any of our other service venues. How does NOAH choose my seats? Why can’t I choose my seats in The Star Theatre? NOAH automatically assigns the seats closest to the stage for you. This also ensures that our seating capacity is maximised and our services are available to as many congregation members as possible. If you wish to book seats other than those assigned to you, you can cancel and rebook your seats. However, this may result in you getting seats that are further away from the stage. I did not receive confirmation emails from NOAH. What is wrong? What time do my children have to be at The Star PAC so that they can register for Rock Kidz classes? What time do I need to arrive for Sunday Services and Encounter Nights at the Star PAC? Give yourself time to travel and arrive at The Star PAC, pass through the access gates and be seated inside The Star Theatre 15 minutes before service starts. The access gates will open one hour before service starts. Will my children need an access media to attend Rock Kidz classes at The Star PAC? Will I need my registered access media to pick up my children after dismissal at Rock Kidz? I’ve booked a space for Rock Kidz class but my child shows symptoms of illness on the service day. Can I still bring him for class? Is there a place for parents to attend service together with their children at The Star PAC? Do I need to book a space for my children for Rock Kidz at Marina Bay Sands Ballrooms or cinema venues? How do I book a space for my children for Rock Kidz during Encounter Nights? What if I forget my seat information? What if I forget to bring my access media? You can gain entry to The Star Theatre by scanning the QR code embedded in your booking confirmation email. If you have booked your seats but do not have your booking confirmation email or access media with you, you may approach our ushers for assistance. For a hassle-free entry into The Star Theatre, remember to bring your booking confirmation email or registered access media with you. If you need any other help while at The Star PAC, look out for our friendly ambassadors who will be stationed all over The Star. What if I lose my access media? I don't have internet access, how do I still make a seat booking? You can ask a friend/family member who has Internet access to book a seat on your behalf. However, if that is not possible, you can consider joining our walk-in queue on Level 3 of The Star PAC. There are 1,000 seats available via the walk-in queue for the first two Sunday English services, unless specified otherwise. The seats are available on a first come, first served basis. If you are unable to make a seat booking for Encounter Nights, please join the walk-in queue on Level 3 of The Star PAC where 2,500 seats are available on a first come first served basis. I didn't book a seat for one of the first two services, or Encounter Night at The Star PAC. Can I still attend the service? You can join the walk-in queue on Level 3 of The Star PAC where 1,000 seats are available on a first come, first served basis, unless specified otherwise. Other alternatives are to attend our 3rd or 4th service at The Star PAC where seat booking is not required, or join us at any of our other service venues. If you were unable to book a seat for Encounter Night, please join the walk-in queue on Level 3 of The Star PAC where there are 2,500 seats available on a first come, first served basis.